This dress is not even a year old and has been worn for 10 months. It is made of high quality turquoise velvet with white embroidery. 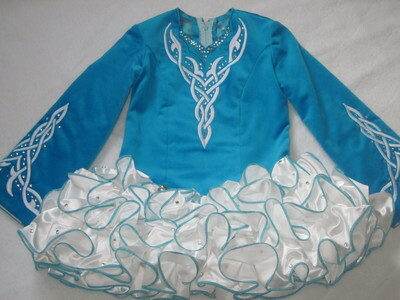 The ruffles are white and outlined in turquoise as well. This dress is in very good to excellent condition and comes from a smoke free home. Included in the sale are 2 different headbands, 2 different bloomers and 2 different soft capes. One cape lace to match the headband and another cape is the same as the curly ruffle skirt. The dress has been embellished with clear crystals of various sizes. This dress has been worn with a Paddy K mod top and stored flat. There is approximately 1 inch let out room on either side of zipper and .75 inch at the side seams. We had an extra ruffle made to lengthen the front which will be included. Can be taken up in the skirt if too long. Asking Price: $CAD995. Shipping costs are included in the asking price for worldwide shipping. Returns are negotiable.